Hair loss may be very disturbing for men and women. For a majority of patients, Platelets Rich Plasma (PRP) will restore hair growth and show visible results within 3-6 months. 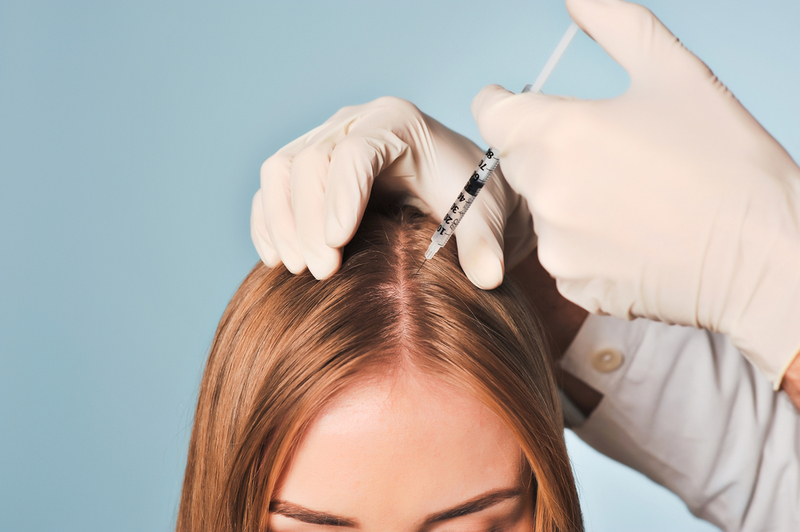 PRP works by stimulating growth of new cells, including hair follicles, when injected into the scalp. We use local anesthetic to minimize the discomfort of injections. Patients may need repeated treatments every month - for women usually 1-2 treatments, for men 3+, depending on the results. Doctor may suggest simultaneous use of other medications, stimulating hair growth for optimal results. How much pain is there with the injections? Pain is minimal, we use a topical anesthetic and also small numbing injections to block the nerves in the treated area. Is it as effective as a hair transplant? PRP does not use hair from other parts of the skin, it only stimulates your own local hair follicles to increase hair growth. This makes it slightly less effective than a transplant, but it is much less invasive and more affordable. Is this a good solution for a completely bald scalp? No, you must have some live hair follicles in order for PRP to work, but it is a great solution for thinning hair, especially in women.